It’s been a hot Summer in Toronto. The heat wave kinda weather that’s consistent every single day. As I'm writing this, it's 29 degrees but feels like 37! I love it being the tropical kind of girl that I am but I have to make sure that I cool down and hydrate myself as well as my family. In addition to water, high raw food is the way to go when it comes to surviving the constant heat – green juices, smoothies, fruits, salads and the special cold treats like these popsicles. I shared a mango salad in my last post and also mentioned my love for mangoes! I love pairing them with blueberries in smoothies and desserts! Personally, I think that they’re just the perfect match, complementing each other’s flavours, colours and textures. This recipe is simple and so easy to make. It only has 5 ingredients and as long as you also have a blender and a mould of some sort, you’re good to go. And did I tell you that no sugar is necessary as mango will sweeten this for you? Just make sure they're extra ripe. Both of the layers have it. The recipe has 2 versions, one lighter and the other more creamy. Blend the ingredients for each layer separately and pour into a container with a spout. Pour alternately into a popsicle mould. Use a spoon to help ease filling them. Tap the mould into the counter a few times to prevent air bubbles. Sometimes you can't really prevent them, it will still taste great. Insert the popsicle sticks. Freeze for minimum of 4 hours or overnight. To serve, run warm water into the mould and pull them out gently. where you can see what I've been up to. I've been making food for family and friends while teaching others how to make plant based recipes whenever I get the chance. And while were talking about this hot weather, we also love infused water as seen here and here. And what's Summer without beautiful wild flowers like these Queen Anne's Lace near our home. Strawberries and chocolates. This combo is seriously delicious! It's not just my favourite but the whole family's especially my son. This dessert is made specifically for him. I usually get a list of what he wants to eat during the week. Now that he has a summer job, it includes his packed lunches and snacks but this is for that special treat usually enjoyed after those few days where he has to take a 2 hour bus ride home. - A high speed blender (this is a must to get that smooth consistency of the ice cream cups). - Small sauce pan to melt the coconut oil and/or cacao butter. Place all ingredients in a high speed blender with the berries and all the liquid ingredients being on the bottom and the cashews on top for easier blending. Whizz until smooth. Adjust the taste. Line the muffin tray with the silicone moulds or muffin liners then pour the mixture into each cavity, leaving approximately 1/8" for the chocolate topping (see photo above). Lightly bang the tray a few times into the counter so the mixture settle. Freeze for 3 - 3/12 hours. In a small sauce pan, boil water then lower the heat. Place all the ingredients in a small bowl and then place the bowl on top of the pan and stir until the mixture is well incorporated. Take out the frozen berry cups then spoon 2 - 2/12 Tbsp. of the chocolate sauce on top. Let it set for 2-3 minutes then top with thinly sliced strawberries and other things that you may fancy like flowers or chopped nuts. Peel off the liners, let it thaw for 8-10 mins. and serve. Enjoy! So it's Father's Day tomorrow. I hope you will make this day a special one for the special dad in your family. My hubby doesn't want any gifts so I decided to make him my version of homemade chocolates. They usually give him that big smile. For this month of June, I'm learning about the heart, my own heart specifically. It's the perfect time to understand God's wisdom about it and see where I can change. And as always, every time you embark on learning something, you sure get tested. Change is not always easy but everything will all work out in the end. Hello November! I see your signs. The air is crisp, the days are shorter and much darker and the leaves have fallen to the ground. Wow, I wanted to linger much longer in a much warmer and brighter October but suddenly here you are. I tend to have more affinity to October than November or even December as I get to celebrate my wedding anniversary on the 30th of this month. This year, it's the 21st. Yay, I'm so thankful that my husband and I both feel joyful towards this occasion! Two imperfect people coming together is not easy but there's hope in becoming true friends and in having a relationship that gets better over time. We had a simple celebration this year. A date at one of our favourite Chinese restaurants in our area this Saturday night. Steamed veggie dumplings, stir-fried baby bokchoy and Singapore noodles are awesome comfort foods for me - especially when it's raining. Then there's the question on the dessert. I sometimes try store-bought ones but personally, there's nothing like homemade dessert! And so as always, I made one. "Nutella Tart." Quick and easy. No baking, no freezing and no high-speed blending required either. Not as complicated as making a raw cheesecake. I thought of sharing the recipe since I know there are many busy career women and moms like me who don't have a lot of time in the kitchen. In a food processor, pulse the almonds and dates. Slowly add a bit of water and continue pulsing until the mixture turns sticky. If your dates are dry, you may have to use all the water. When ready, transfer and press into two 4.75" mini tart pans or if you don't have them, you can also use a pie pan or a bigger size tart pan. Make sure to cover the sides as well. When done, place them in the fridge while you prepare the filling. This photo on my Instagram page shows when the crust were just done. In a bowl, mix the hazelnut butter, cacao powder and maple syrup until they are fully incorporated. Adjust the taste. Take the pans out from the fridge and place the filling over the crust smoothing the top by using a spoon or for best results, an angled spatula. Add your fruit toppings and put it back into the fridge to set for approximately 30 minutes. It's easier to cut them this way. 1 small Fuji apple, cored and sliced paper thin (best by using a mandolin) or your choice of fruit. Mix the apple with 1 Tbsp. of lemon juice. The apples will soften with the addition of the lemon and will not be a challenge when you cut and serve the tart. This tart is great with figs or different types of berries. See this sample of one I made on our Thanksgiving celebration. Here are some November images from our neighbourhood. I'm thinking a lot about this Scripture lately. I am humbled. I am grateful. My prayer is that I do not forget it or get sidetracked and take it for granted. Happy November! The 4th of July is not only a grand celebration at the South of the border but also at our home. Our boy was born on the 4th of July seventeen years ago. My, how time flies! At first, I was just like any other mum, very excited and at the same time tired or a bit confused on being a new mother. Sleep was elusive as he was an active baby with no set routine. He loved to interact, played a lot and constantly needed company. I thought I would never survive the early part of motherhood. Then, as if I just blinked and he's a grown young man, taller than his 5'9" dad. And he's 17. How cool is that! These last few days, I've been reflecting on how much God has blessed my husband and I with this wonderful gift! We had him 4 years after we were married, something we thought would never happen as we had a few hurdles to overcome, mostly me in trying to conceive. Psalm 127:3 says "Sons are a heritage from the LORD, children a reward from him. It's a scripture that I hold dear to my heart. So to celebrate, I made a 3-layered vanilla and berries raw cheesecake. The closest we can get to to red, white and blue. He loves berries and of course the cheesecakes that I've been making lately. It's a variation of this earlier post, my own birthday day cake in January...except it's a bit bigger. Berries are currently in season and many of them are locally available. Just make sure to pick up organic varieties if you can. Strawberries are on the list here of produce with high pesticides called the Dirty Dozen +. Place all ingredients in a food processor and pulse until mixture becomes sticky. Transfer into an 8" Springform pan and press firmly. You can also use a 9" and the cake will be just a tad thinner than this one. In a high speed blender, combine the first 6 ingredients and blend until smooth. Divide the mixture into thirds. Put back 1/3 into the blender, add the strawberries and blend until incorporated. Adjust the taste if necessary. Pour into the crust. Place the pan in the freezer for 10 mins. to firm up. Next, pour the other 1/3 (vanilla layer) over the strawberry layer. Place it back into the freezer for another 10 mins. Rinse the blender and add the last third with the blueberries and blend until smooth. Adjust the taste. Bring out the pan again and pour over. the vanilla layer. Freeze for 6 hours. To serve, pop out the cake from the pan while it's still frozen. This will keep the cake from sticking into the sides of the pan. Let it soften for 20-30 mins. Run a knife through hot water then cut the cake. Top with berries. I love this cake when it's semi-frozen. It tastes like ice cream! The sweetener can be reduced to 3/4 cup. I'm serving this to our extended family who would enjoy a much sweeter dessert. Other kinds berries can also be used like raspberries and blackberries. For these types, it's a good idea to strain the seeds for a smoother consistency. Did you celebrate the 4th of July? When I made this cake, I also gathered some wild flowers near our home. They are so pretty! Summer is such a fun season. I'm trying to enjoy every bit of it since the warmer months in Canada are too short. I hope you are having your own share of Summer fun! It's Father's Day and it's a time to celebrate! And what better way than a cake! This time of year reminds me of all the tropical fruits in the Philippines and mango comes in on top of the list. We have so many in our backyard back home and every summer we have mango overload! As a little kid, I loved it so much. In the heat of summer, I would just have it for lunch, not caring too much of cooked food. Of course at this time, I also remember my dear Papang who planted all those mangoes and fruit trees for us. He's the best! I remember him as a great teacher, community worker, the original Mr. DIY. He can fix everything even your lack of Math skills. I've got these perfect Manila mangoes and so I thought, why not a mango cheesecake. So here it is, my first try and I'm happy it was enjoyed by both of my boys (I call my hubby as one of the boys too) and as I write this post, my teenager has asked me to make another one. It's now in the freezer and he's waiting patiently for it to set. In a food processor, pulse all ingredients until mixture gets sticky. Transfer and press into a 7" Springform pan. On a high speed blender, blend everything except for the coconut oil until smooth. Add the oil and continue blending until well combined. Adjust the taste. Pour filling into the crust. Blend both ingredients until smooth. 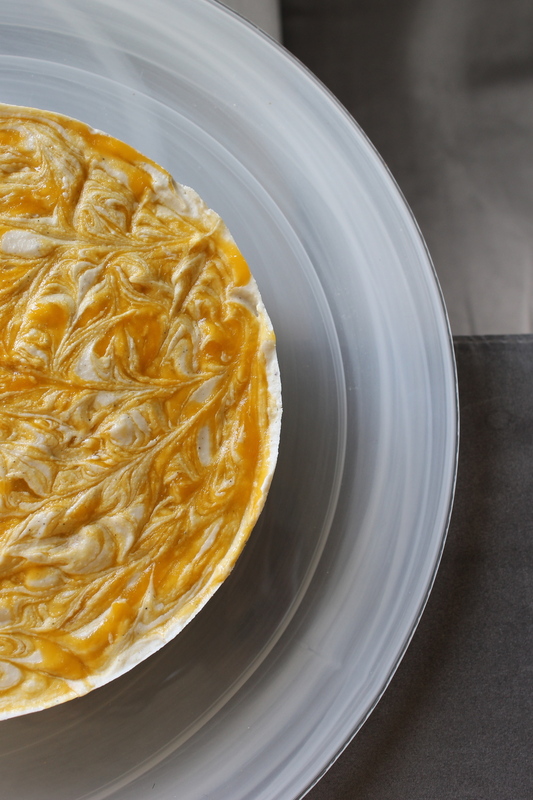 Pour the sauce on top of the cake and using a chopstick, create swirls of your own design. I'm not really a pro on this but I found that any design would look pretty. Freeze for 4-6 hours or until cake is solid. Remove the cake from the pan while it's still frozen is best (prevents it from sticking into the sides) then let it sit for 30 mins. before serving. Or if you prefer it frozen like me, you can just run a knife in hot water and cut the cake to serve. Enjoy! 1. If young coconut meat is not available, use 1 1/2 c. of raw cashews. 2. Any fruit of your choice can be used instead of mangoes.